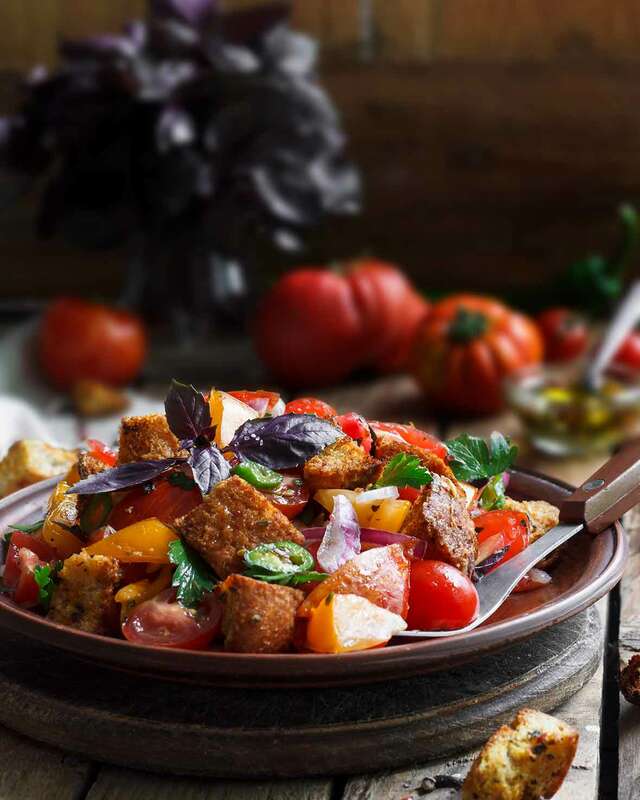 This panzanella, aka Tuscan bread salad, is simply croutons made from day-old bread, tomatoes, cucumbers, red and yellow bell peppers, onions, and a tangy vinaigrette. 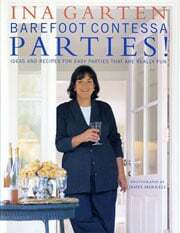 An Italian classic as interpreted by the Barefoot Contessa herself. 1. Whisk together the garlic, mustard, vinegar, oil, salt, and pepper. 2. Heat the oil in a large saute pan. Add the bread and salt and cook over low to medium heat, tossing frequently, for 10 minutes, or until nicely browned. Add more oil as needed. Remove from the heat. 3. In a large bowl, combine the tomatoes, cucumber, red pepper, yellow pepper, red onion, basil, capers, and, if desired, parsley. Add the bread cubes and the vinaigrette and toss to coat. Season the bread salad liberally with salt and pepper. Serve immediately or let the salad sit for half an hour to allow the flavors to blend before serving. Panzanella Recipe © 2001 Ina Garten. Photo © 2018 Yuliia Holovchenko. All rights reserved. All recipes and photos used with permission of the publisher. Flavors: What is so pleasing about this salad is that it is filled with a medley of garden flavors that really play well off one another. The understated tomato and cool cucumbers and peppers are given a little zip and zing with help from red onions and capers. All of these vegetables also accept the tart flavors of the dressing (which was not oily or overpowering) easily. My favorite ingredient in the salad was, of course, basil. I liked how it bridged all the flavors in the salad together while still allowing the vegetables a chance to show off their true identity. Color and Texture: Bright and colorful are just a few words to describe this salad. Its stunning presentation allows you to appreciate all of its shapes and colors: cubes of red and orange peppers, rings of purple onions, and pieces of green cucumber and basil. This lively display combined with the texture from toasted cubes of bread and crisp vegetables contrasts well against the soft tomatoes. Timing: This salad is easy to make. Cutting and chopping the vegetables takes a little bit of time, but not too much. The dressing is also a cinch to make. Just put the ingredients in a bowl, whisk them together, and you’re done. Other Comments: I used some homemade French bread in this salad. First, I cut it up into hearty cubes, sautéed them in a large skillet coated with olive oil, and let them cook until they were evenly toasted. This took about 10 minutes as the recipe suggested. This plain-tasting but sturdy bread really stood up well in this salad: it helped mop and soak up the flavors from the vegetables and dressing without becoming too soggy. Side note: Even though French bread is commonly used in bread salads, I think that olive bread would work equally well. After all, olives are indigenous to the Mediterranean region, and would, therefore, complement all of the ingredients used in this recipe. You could even add hot peppers, anchovies, and cubes of meat and cheese like ham and mozzarella for variety. I have been making this salad every summer when tomatoes are perfect for picking from my garden. Very yummy, I make the bread all year, why would anyone buy croutons after trying this perfect, easy recipe. I love this recipe! I altered it a bit, I added some Greek yogurt to the dressing and it’s great! When I watched this recipe on the show, I thought she added feta cheese, that’s why I added the yogurt. This recipe doesn’t call for feta but I love the extra creaminess added by the yogurt! I made my croutons with whole-wheat sourdough and I wasn’t sure at first that that type of bread would work, but it was great! I’m so happy and I love this salad! Wonderful to hear it, Susan. I think your changes sound fab. This is so wonderful. My hubby dislikes the bread in it (weirdo) so I often just use the veggies and dressing and serve it as a chopped salad. Delicious! Ok, Mom24_4evermom, that is a little weird. But husbands are weird, right?